Decorating advice from Lulu & Georgia’s founder. 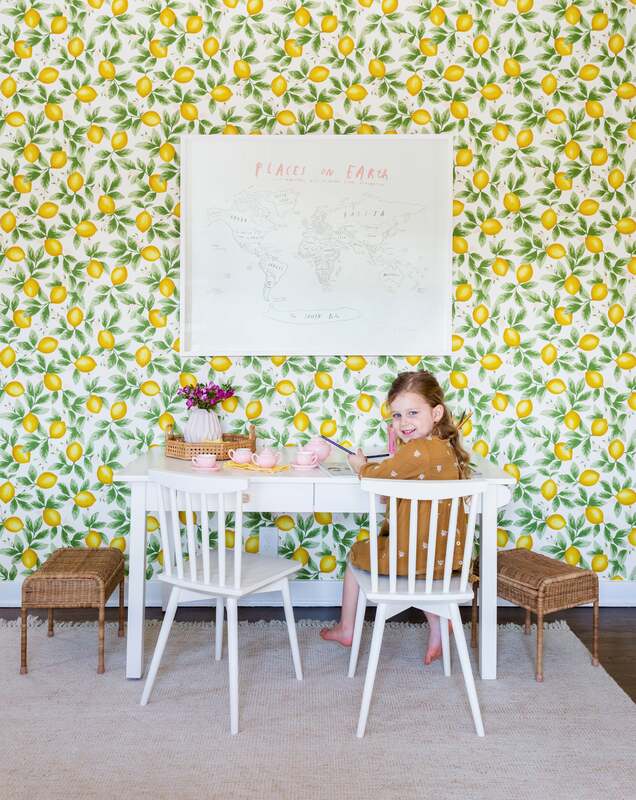 It’s not often we say we’re jealous of a child, but Lulu & Georgia founder Sara Brenner designed the coolest space for her daughter, Vivian, and we’ll be thinking about the wallpaper all week. Of course, having a chic nursery is made endlessly easier when your mother is at the helm of an uber-successful design business. Working with designer Ginny Macdonald, the design duo transformed the 13×10 space into a cheerful bedroom—though they took care to ensure that it never veered into stereotypical “little kid” territory, despite the room’s three-and-a-half-year-old inhabitant. “I thought the lemons felt whimsical yet sophisticated and didn’t scream ‘kids’ room’—it can grow with her,” says Brenner, noting that she could just as easily see the fruit-emblazoned print hanging in a dining nook. Color-wise, the room follows the bright example set by the citrus wallpaper. Tones of yellow, like the ochre-hued bedding, are the perfect tie-ins to the lemons, while turquoise-painted doors frame the playroom and add an unexpected pop of contrasting color. It’s all balanced by simple white and off-white textiles and a smattering of natural materials, which ground the space and keep it feeling elevated. After the color palette was sorted, Brenner and Macdonald turned their attention to smart storage—something that any parent would instantly recognize as an essential. For Brenner, the starting point was the window seat. Elsewhere, decorative bins that double as accent pieces have proven a useful solution to keeping the room tidy. Brenner recommends removing toys, like building blocks or magnet tiles, from their original packaging and keeping them in bins to streamline the look of a space while still maintaining organization. Everything has a place: Dress-up clothes have a home in an upholstered storage bench, and a wicker Olli Ella stool serves as a sneaky hideaway for books and smaller objects. Aside from Lulu and Georgia, Brenner turned to brands like Smallable and Lakeshore Learning for stylish but fun toys and kids’ accessories. The unique pieces come courtesy of Etsy—though Brenner’s favorite piece from the room is actually a gift. Keep reading to see where you can pick up some other favorites from the space. If you’re looking for a place to start with your own nursery design, Brenner has some advice on the one item worth splurging on: a big, good quality rug. The wallpaper that started it all. Embrace the summer season with this fruity print. Ochre is trending; try it in an unexpected manner with luxe bed sheets. This chic woven stool can be used as a nightstand, where the storage comes courtesy of a flap at the top rather than typical drawers. The ultimate solution to a small space, this cushy bench is both extra seating and storage.